NAIROBI, Aug 1 2012 (IPS) - On a chilly morning at the Moi International Sports Centre in Nairobi, the largest multi-purpose sports centre in Kenya, 800m world record holder David Rudisha looked like just another athlete. At 1.90m tall, Rudisha is not diminutive. But as he trained with Kenya’s reigning Olympic and world 1,500m champion, 23-year-old Asbel Kiprop, and close to two dozen of the country’s top athletes in a strict regimen of pre-Olympic training, he appeared to be just another member of the Kenyan team. But Rudisha and his teammates are far from average. The East African nation’s athletics team competing in this year’s summer London Olympics consists of three Olympic and four world champions. Rudisha, 23, has been tipped as a potential favourite to break his own 800m world record time of 1.41.01 at the games. Vanity Fair called him “the best Olympic track star” yet to be discovered. The magazine said that once he takes to the track in London, Kenya’s star runner will become a global household name – just like the Olympic and world sprint record holder Usain Bolt. However, Rudisha is already a household name in Kenya, with locals nicknaming him “King David”. Any medals he and his team mates win will really be medals also for the developing world, given that athletics is dominated by sportsmen and sportswomen from the developed world. But when IPS met with him after his training session, he played down the adoration. Instead, his mind was focused on winning gold. For almost a month, the athletes trained uninterrupted and in isolation, with no visitors allowed. But the media was given access to them during one of their last training sessions on home soil before they boarded a flight for the United Kingdom on Jul. 30. The team had opted to remain at high altitude for as long as possible, deciding against training in England. The soft-spoken athlete told IPS that he was confident of winning a gold medal at his Olympic debut in London. “I don’t think I am going for anything less than gold. This is my first Olympics. Since I am the world record holder and the world champion, so far, I want to clinch Olympic gold. It is the only medal missing on my shelf,” Rudisha said. He exuded optimism, buoyed by his good running times this year. “This is my best year already and I am in the best shape of my life. So I want to go there and win,” Rudisha said. He said spirits in the Kenyan camp were very high and the team expected to win a number of medals at the Olympics. “We expect good results, and good things to come from this competition,” he added. Teammate Kiprop told IPS that Kenya currently boasts the best team in middle-distance running, and that the world should expect his country to take all the medals in the 1,500m. “We have a very strong team in the 1,500m with me, Silas Kiplagat and Nixon Kiplimo Chepseba being the three top athletes in the world at the moment. 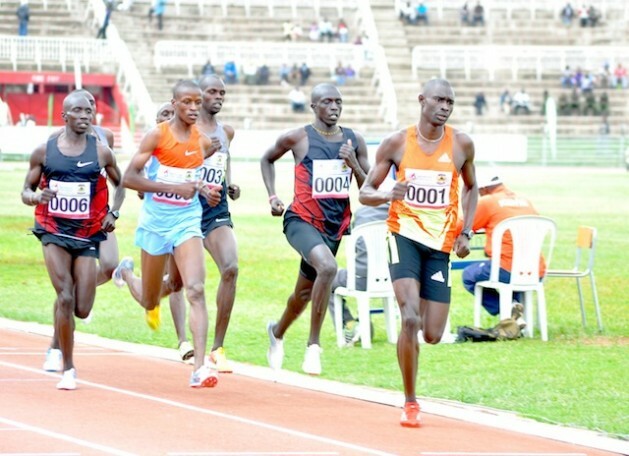 If things work well, we are surely talking of a clean sweep in the 1,500m,” Kiprop said after his training session. Also included in the team are double world 5,000m and 10,000 champion Vivian Cheruiyot; reigning 800m Olympic champion Pamela Jelimo; former 800m world champion Janeth Jepkosgei; and world champion marathon runner Edna Kiplagat. Ezekiel Kemboi is the reigning Olympic 3,000m steeplechase gold medallist, and Brimin Kipruto is the current 3,000m steeplechase world and Olympic champion. Kiprop, meanwhile, played down expectations of breaking the 1,500m record. He effortlessly won the 1,500m with a world-best time of 3:28.88 at the Herculis Meeting in Monaco in July. “At the moment I think the first priority is to win an Olympic gold medal, and then we’ll see when to attack the record. If not this year, maybe next year,” he said. Jepkosgei, the country’s Olympic women’s 800m silver medallist, wants to bring home a gold medal. She said that her primary focus was to make it to the finals of the 800m. “Obviously, I want to be on the podium. The 800m is a tactical race, but I am prepared for this,” she told IPS. Jepkosgei said she anticipated stiff competition in the heats. She singled out African champion Francine Niyonsaba of Burundi, her Kenyan compatriot Jelimo, South Africa’s Caster Semenya and Russia’s Mariya Savinova as some of her biggest threats. She could not say if she would be able to beat Jelimo if they met in the finals. “I can’t tell if I can beat her, but am going to do my best,” she said. Indeed Jepkosgei and her fellow athletes know that Kenyans expect nothing less than victory from them. The country’s runners are legendary and Kenya has been a fertile training ground for the development of world record-setting athletes. Since Kenya participated in the Olympics for the first time in 1956, the country has won a total of 78 medals, mainly in athletics and boxing. Kenyan Henry Rono is considered the greatest long-distance runner the world has known. In 1978, in less than three months he broke four world records: the 10,000m, the 5,000m, the 3,000m steeplechase, and the 3,000m. It is an achievement that no one has been able to beat. Kipchoge Keino, a two-time Olympic gold medallist whose winning time at the 1978 Summer Olympics remained the 1,500m record for 16 years, is still a national hero. Assistant head coach for the Kenyan Olympic team, Sammy Rono, told IPS that they would enter as many athletes as possible in the races as part of the country’s game plan to win as many medals as they could. “It will then give us a strong base to execute their strategies in the individual races,” Rono said. “Anything goes in these championships…There is no room for mistakes,” said Rono. Olympic head coach, Julius Kirwa, told IPS that beyond seeking to maintain the country’s success in middle-distance running, Kenya will aim for medals in the men’s and women’s 10,000m, and in the 5,000m men’s race. “We have trained well and are hopeful, but at the same time we are cautiously optimistic. In 2008 we had six gold medals; we hope to surpass this number,” he said. The team landed in London on Tuesday Jul. 31.